* Get organized! With The Journal you can be as organized as you want to be! Keep your "daily pages" separate from your work notes, or your dreams separate from your correspondence–but only if you want to. * Do it Your Way! The Journal has no "agenda"–except to be as useful as possible. Use any journaling style you want, or none at all. It’s completely up to you! * The Journal Newsletter! Sent out monthly, The Journal Newsletter provides tips for using The Journal, articles about journaling and writing, writing exercises, and more. 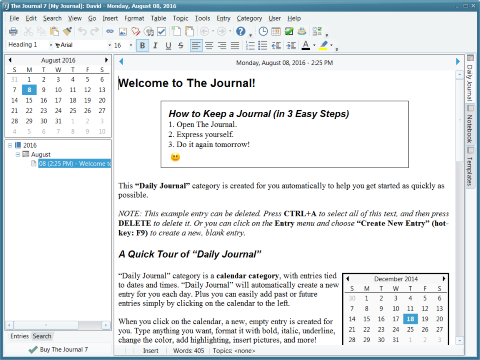 DavidRM Software’s The Journal makes it easy to keep a daily journal, for both personal and professional use. Whether you want to record your thoughts and dreams, your research notes and writing exercises, your project planning notes and decision details, or just about anything else, The Journal provides an easy-to-use mix of convenience, flexibility, and security. Fast-loading and with the option to "sit" in your Windows system tray, The Journal is always available when you need it. Create as many or as few entry categories as you want, daily entry or "loose-leaf", to be as organized as you want to be. Store text, images, and just about anything else in your entries, and know that The Journal’s password-protection and built-in encryption will keep them all secure.